There are few things more comforting than a hot bowl of curry – Thai, Indian, green, red, or massaman – I’ll never turn down an oportunity to try a new vegan curry recipe. Luckily, most supermarkets these days stock up on an amazing selection of curry pastes and chutneys which makes it easy to recreate what you order at most restaurants. 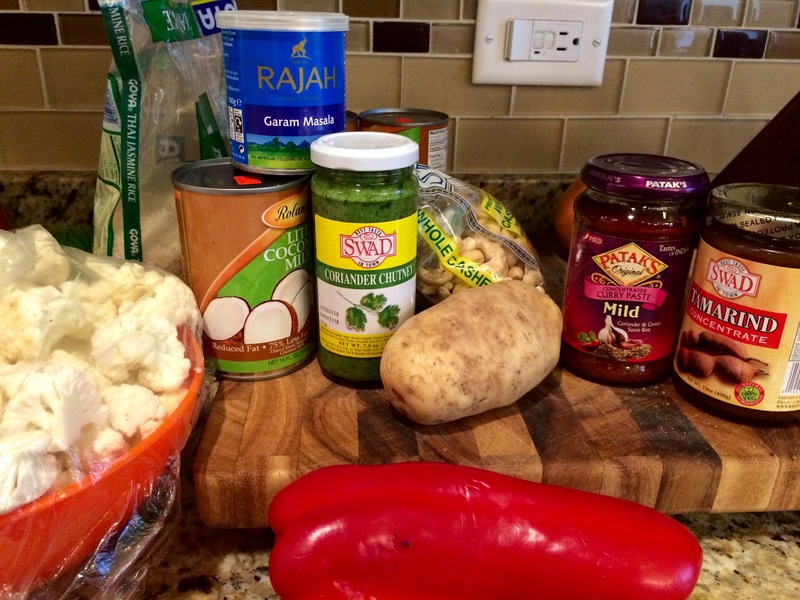 This recipe for Massaman Curry comes from www.veganricha.com and has a smooth, creamy coconut milk base with an earthy peanut and ginger flavor. The tamarind concentrate add an unexpected hint of lip-smacking sweet and sour which blends well with the subtle heat from the curry paste. I’m kind of obsessed with coriander chutney these days so of course added a heaping spoon on top when serving. In a large sauce pot, add oil and heat at medium heat. Add onion and cook for 4 minutes. Add ginger, garlic, bell pepper, cauliflower, potatoes green beans, salt and mix. Cover and cook for 5 minutes. Mix in the carrots, curry paste, garam masala and cook for 2 more minutes. Add peanut butter, salt, tamarind, coconut milk and water and mix well. Cover and cook on medium heat for 15 -20 minutes until the curry thickens a bit and the veggies are tender. Garnish with slivered basil and whole cashews. Serve hot over rice.